Mostly students come from India,Nigeria,Ghana,Pakistan,Zambia,Zimbabwe,Sri Lanks,Morocco,Jordan,Turkey,Iran,Namibia,Cameroon,Turkmenistan,Azerbaijan,Uzbekistan and many more. After graduating from a medical university in Belarus they always have opportunities to work abroad or in their own country. At present more than 2000 international students are studying their MBBS degree in Belarus and it proves the high quality standard of medical education in Belarus. After graduating from Belarus international students always have opportunities to study further for their specialization in Belarus or abroad. 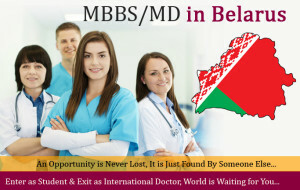 In Belarus clinical residency program for medicine graduates lasts for 2-3 years and medium of instructions for post graduation after MBBS is Russian. They may also apply in UK or USA for their specialization plan as the degree in medicine they earned is WHO recognized so it allows them to go for their specialization anywhere they like. 1:Mostly international students come from the countries where the official language is English and they want to study in English medium of instructions.Belarus offers the MBBS course fully in English medium of instructions for them so no need to learn Russian language and they may join directly their MBBS program in English medium of instructions. 2:Normally if you want to study any course abroad in English medium of instructions ,you must have IELTS or TOEFL results but for MBBS admission in Belarus for international students you do not need any English language test. 3:MBBS degree from Belarus is internationally recognized so you may practice anywhere in the world after graduating from Belarus in general medicine.Belarus medical universities are government owned and recognized by WHO. MBBS in Belarus is a general medicine course taught in English medium of instructions fully for those who are good at English or their country’s official language is English. At the Faculty of MBBS in Belarus the educational process is provided in two languages, Russian or English, and lasts for 6 years. Those international students who are not good at English or their native language is not English first year study at preparatory faculty with science subjects and after completion of preparatory course they join their MBBS in Russian medium of instructions. There is no any complicated admission process for international students in Belarus like other European countries. Belarus has free merit system for international medical students but they must have studied Chemistry and Biology in school or college with passing marks. Admission process is very easy at medical universities in Belarus for international students. As we have mentioned already that there is free merit system for international students admission at Belarus medical universities but applicant must have passed secondary school with science subjects especially Chemistry and Biology. Applicant scan us his/her secondary school certificate with travel passport copy for eligibility assessment and assessment takes 1-2 days.Eligible applicants transfers the admission fee and we forward his/her documents for processing and approval at migration department. This processing takes 2 weeks and than original study invitation is couriered to the applicant as he/she must require an original study invitation for visa application at Belarus Embassy. There are 4 medical universities in Belarus and all these 4 medical universities are government owned state universities. These all medical universities are recognized by WHO and many international students are studying their MBBS program at all these medical universities. This university may say the leading university for medical students in Belarus in the city of Minsk which is also the capital of Belarus. As a matter of fact this university was Belarusian state university and in 1921 this state university started the faculty for general medicine so it has a long history in the medical education in Belarus. in 1930 it was given the status of medical institute properly.In start there was only one medical faculty for general medicine at this university and medium of instructions was Russian only but later after years it expanded and a dental faculty was started at this medical institute and it was 1960. In the early years only nationals of Soviet Union were studying at this university and there was no faculty for international students training but later in 1967 international students faculty started. in 2011 a new faculty was introduced university started train pharmacists. Uzbekistan,Latin America and Russia etc etc are studying at BSMU. Now in 2018 Belarusian state medical university is worldwide know with full recognition by WHO and other world institutions. Belarusian state medical university has its own hostel for national and international students. These hostels are well equipped with all facilities and 3 students share a room. Grodno state medical university is situated in the city of Grodno. This city is situated on the borders of Poland and Lithuania and a very beautiful city with greenfield around. Grodno state medical university is the leading one in Belarus which welcomes many international students every year from different countries. GSMU has medical faculties for different courses but most of the international students come to join MBBS at Grodno state medical university. University has its own hostels for national and international students with all facilities. MBBS at Grodno state medical university is taught in English medium of instructions and also in Russian medium of instructions.Mostly students come from African and Asian region and most of them study their MBBS in English at Grodno state medical university. University also has preparatory course faculty for those students who are not good at English or their native language is not English.These students normally come from Arab and french speaking countries. Grodno state medical university has its own hostel for national and international students where they reside during academic program. Gomel state medical university is located in the city of Gomel which is a border city with Russia and Ukraine. GSMU also welcomes a lot of foreign students every year for MBBS program. University is recognized by WHO and has its own hostels. MBBS is taught in English medium of instructions at GSMU. MBBS faculty for foreign students at Gomel state medical university started in 2000. Mostly students are studying at GSMU from Nigeria,Ghana,India,Sri Lanka,Pakistan,Syria,UK,France,Peru, Russia,Ukraine etc etc. University also prepares international students at preparatory faculty where students from Arab and French speaking countries study their preparatory course with science subjects. These students study their MBBS in Russian medium after completion of preparatory course. Gomel state medical university has its own hostel for national and international students where they reside during academic program. Vitebsk state medical university is situated in the city of Vitebsk. Vitebsk has borders with Russia,Lithuania and Latvia . VSMU trains MBBS students from many countries and directly in English medium of instructions. University has its own hostels for all students nationals and internationals. University trains students at different faculties like Preparatory,MBBS,Pharmacy and Dentistry. Medium of instructions is English and Russian. Interested applicants may contact us for their admission at medical university is Belarus for 2019 intake today. We assure you of a very fast and quick admission processing. I am studying in a medical college in my country. I want to continue my study in europe for some personal reasons. Which university can I study for affordable cost?I have a question, transfer possible outside of Europe. Please give me some advice about that.